Further to my post at the weekend about my trading style outside of a major meeting, I thought I would raise my hand to the mouse today show you. I had planned to do this anyhow, but a couple of comments about me using ‘old’ results meant any thought of me not doing it was summarily dismissed and trudged my way through the snow late this morning to slip and slide into the office. The reason for showing older results was simply to show you something relatable to how you should trade and how it hasn’t changed that much for me. Today proved a good example anyhow. As you can see and as I’ve said frequently. I tend to win 7 or 8 out of 10 races on average. Today was 16 out of 19 or an 84% strike rate, which is pretty good for a Monday. 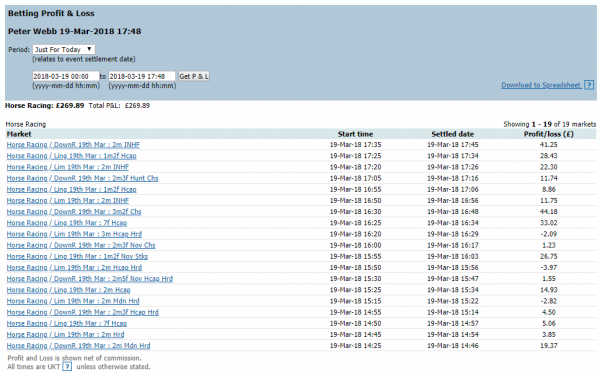 My average profit per race was £14.10, £17.42 for a win and I managed to keep losses well under control today at just under £3.00 on average. I didn’t use large stakes today. I couldn’t for starters, unless I pushed it, which I didn’t want to do. But I also wanted to keep liabilities small to show that even with relatively small stakes you can pull out a reasonable result. Of course, what you are looking at here is 18 years of practice, so you should expect at all to replicate these results. But that isn’t the point really, just to show you what a ‘real’ P&L looks like. It’s a mixture of profits and losses spread over a period of time with a good average result. If you asked me to appraise how I did, I did well today. Strike rate was high and losses were kept well under control, so that’s what I would count as good trade entry, exit and management. You don’t tend to get all three together so consistently. As a newbie, you would find this almost impossible. The overall result is tiny compared to last week but again, that’s not the point. It’s to show you that good trading is all about pulling out a good average result. Multiply the average result by a large of races and the overall result looks massive. My general strategy is to try and find points in the market where losses are less likely and then catch some upside. I tend not to get large losses because I put myself in the position where they are less likely. My average rises on good days and falls on poor days. I adjust my stake and level of aggression in the market according to how I expect the market to trade. I don’t set a target, I don’t get large losses every now and again that wipe out previous profits, I just trade what’s in front of me. It’s served me well now for nearly 200,000 races. Too many ‘traders’ focus on being right and not enough on your true objective of a positive trade at low risk, that’s the definition of a good trade. It really is a case of, slow and steady wins the race.